We’re going on a little vacation this weekend, so it’s nice to not have to buy groceries and also use up the stuff in the fridge. Also, periodically, I like to make a ton of soup, which can be frozen in containers for lunches. The timing was perfect for this soup, which is equal parts cheap to make and tasty to eat – the sweet potato gives the soup great texture and a touch of sweetness, and the combination of chipotle and lime makes it seriously flavourful. It’s super good for you – low in fat, high in fibre, and filled with healthy stuff. Also, it goes very well with cold beer. So, no one loses! Even if you don’t have this stuff in your fridge, I recommend a trip to the market to make this one on a weeknight. It’ll take you about an hour, not including the time to soak the beans – just plan ahead a bit, setting the beans to soak before you leave for work. And the leftovers are even better the next day. Drain and thoroughly rinse beans. Don’t use the liquid you soaked the beans in, because that liquid contains something like 80% of the farty compounds that make beans so unpleasant sometimes. If you drain and rinse, you’ll wash that away. Set aside. In a large pot, sweat onions, sweet potato, and celery in olive oil. Add garlic, and pour beans into the pot. Fill pot with four cups of water. Remove pot from heat, and blend until smooth with an additional two to three cups of water, adding extra water for thinner consistency, if desired. Return to heat, and stir in cumin, coriander, and the juice of the lime. Add salt and pepper, taste, and adjust seasoning as needed. 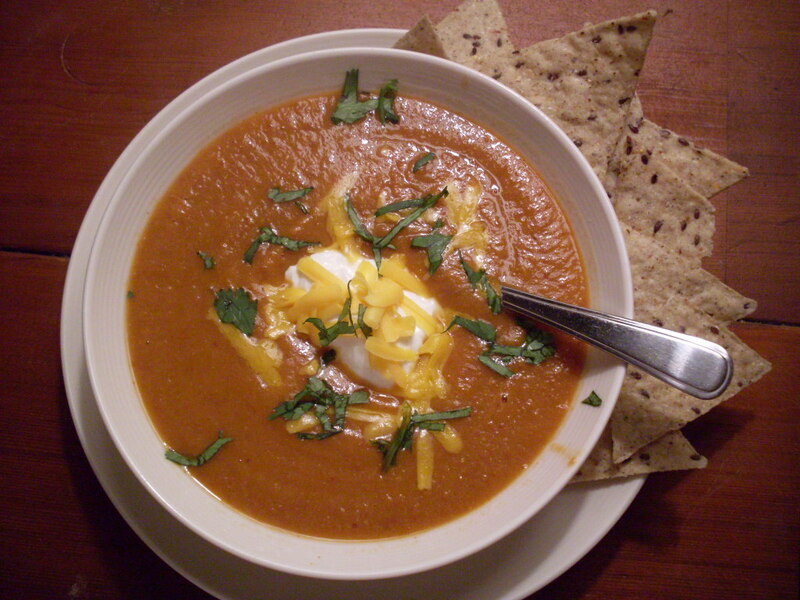 Serve with a dollop of sour cream, topped with shredded cheddar cheese and chopped cilantro. A side of tortilla chips is a nice touch. And don’t forget the beer. < Previous Tangelo Tart: Not just an amazing stripper name. Next > Leek and bacon barlotto. The red bean soup is delicious! We tried it out for our Wednesday night gathering. Spicy and flavourful. We used 2 cans of red kidney beans instead of the dried. I think you forgot to mention when to add the tomato paste – we added it in at the beginning of the simmering but after the boil. Thanks for the recipe! I’m so glad you liked it! That was the exact right time to put in the paste … I will have to go fix that. Thanks for trying the recipe!! Your husband gave me your link at work. He always brings gourmet food to work. I’m looking forward to trying your fabulous recipies at home and making my cooking time a bonding and fun time with my 16 year old daughter!! I’m so glad to hear from you! Nick’s told me about you – I hope you try a few recipes, and let me know how they work out!